You are here: Home / Open Innovation / Business Model Innovation / What is a Business Model ? In this article I will try to answer the question “What is a business model?”. I will use a formal definition from Alexander Osterwalder and dive into tools and concepts that might be of use when you start playing around with innovating your (company’s) business model. Osterwalder et. al come up with a format definition of the term business model in their Business Model Generation handbook. Professor Henry Chesbrough shared his experiences at Quantum Corporation, European Masterclass on Corporate Entrepeneurship & Open Innovation, and emphasized that Quantum Corporation didn’t have the best technology, but won the battle from competitors due to the superior business model. An empty canvas is shown in the picture above and consists of 9 logically ordered building blocks. 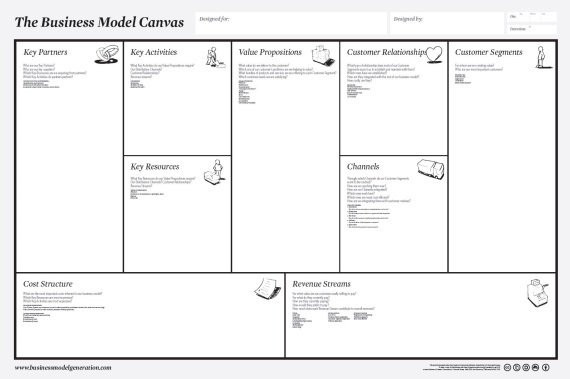 The YouTube video Business Model Canvas Explained provides an overview of the Business Model Canvas an its building blocks in about 2 minutes. The book Business Model Generation – A handbook for Visionaries, Game Changers and Challengers might be helpful inventing new business models. Furthermore the Business Model Generation handbook consist of common types of business models, that can be used to develop new business models. Steve Blank, listed in 2012 as one of the “Masters of Innovation” by Harvard Business Review, has developed the customer development model. The customer development model is the business model testing process, which helps to test the various hypothesis of the initial business model idea. Read Steve Blank’s latest books the Four Steps to the Epiphany or The Startup Owners Manual, which both include the customer development model and other relevant information for entrepreneurs and start-ups. Enjoy innovating your own (company’s) Business Model ! !